This view of Rock Island Dam, some 150 miles downstream from Grand Coulee Dam, shows the fish ladders located at both ends of the dam, and one in the center at the end of the island. The fish trapping and loading devices have not yet been installed. 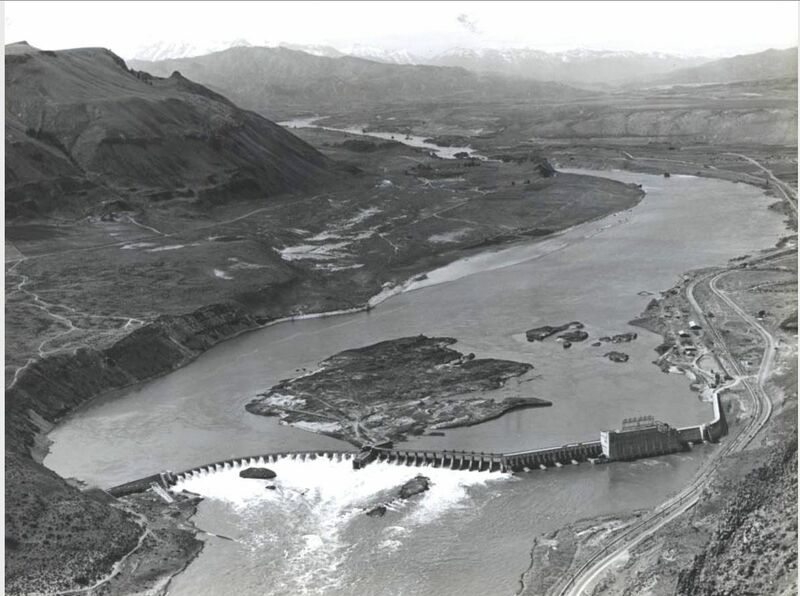 This dam, built by Stone, Webster Co. in 1932 for the Puget Sound Power and Light Co. at an estimated cost of $25 million, is a part of the plan for comprehensive development of the Columbia River drainage." The development of fisheries along the Columbia has a long and varied history. Even before the advent of the white man, some 50,000 persons made the salmon a substantial part of their daily diet, taking an estimated 18 million pounds in their annual catch. The first recorded commercial fishing operations involving export of Columbia River salmon occurred in 1829, when Captain John Dominus of the ship Owyhee salted down 58 barrels for export shipping. The first canning plant was established on the Columbia at Eagle Cliff, Washington, by the firm of Hapgood, Hume and Co., which put up 4,000 cases of salmon in 1866. By 1883 some 39 canneries were in operation." Since 1866 the river has produced almost 2 1/4 billion pounds of salmon, or a value close to a billion dollars." On Dec. 29, 1938 the U.S.B.R. awarded a contract for 8 specially constructed tank trucks to be used for hauling the trapped fish from Rock Island Dam to the Leavenworth holding ponds, to the Kenworth Motor Truck Corp. of Seattle for $59,041.12.